Summary: A story from debut author Abby Fabiaschi that is "as absorbing as it is illuminating, and as witty as it is heartbreaking." Normally, I liked to read thrillers as a way to escape from the realities of my day-to-day life; however, every once in awhile I liked the read a book that touches my heart and makes me think. 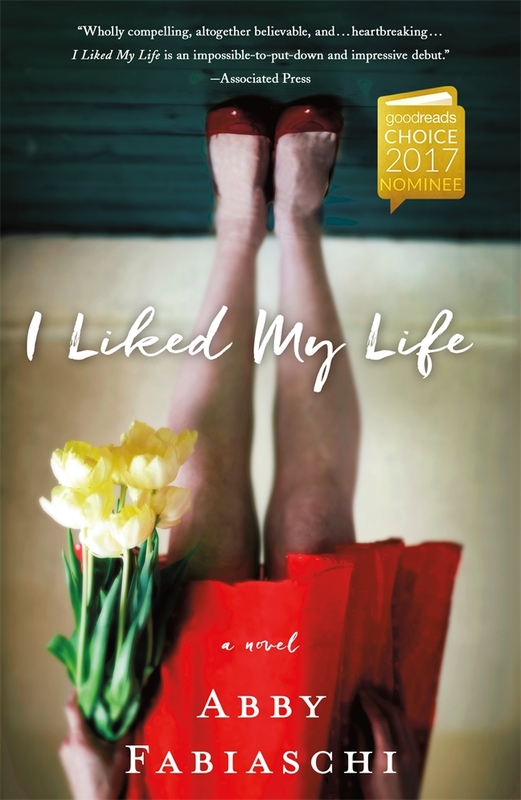 I picked up I LIKED MY LIFE by Abby Fabiaschi because the reviews I had read (including this one by Kathy) made me curious about how this novel could work. At its simplest, this novel tells the story of a grieving family and how they came to terms with the loss of their wife and mother. However, there's a bit of a twist on this story -- the book provides the point of view of the deceased mother and how she is trying to manipulate her family's lives. Maddy is a stay-at-home mom and seems to have a pretty terrific life. Her husband Brady is a successful business man and her daughter Eve is a great teenager. Maddy seems to do everything just right -- from entertaining, to providing advice, to always knowing what to others need. However, out of the blue, Maddy commits suicide... and it leaves Brady and Eve devastated. How could they have absolutely no idea that Maddy was in so much pain? Meanwhile, Maddy isn't quite ready to let go of her family either. Her family is trying to piece together the truth about Maddy's last few months, while Maddy is trying to make things better for them from back on Earth. When Maddy discovers Rory, a school teacher who might be exactly what Brady and Eve need, she does her best to interview from the "great beyond." Can Brady and Eve find some peace and move on after the loss of their loved one? I enjoyed I LIKED MY LIFE quite a bit; and while it was very sad at times, I do think the overall effect of the novel was a positive and uplifting one. I was extremely impressed with Ms. Fabiaschi's writing skills; and as far as I'm concerned, she pulled off a pretty impressive feat with this book. The book received starred reviews from Library Journal and Booklist, and it has some great blurbs from some of my favorite authors... so I'm not alone with my praise for this book! One of the strengths about I LIKED MY LIFE is in the character development. As a stay-at-home mom for years, I could relate to Maddy and much of what she said about her life. There's no doubt that my affinity for her made this novel more relevant to me, and I think many moms will agree with me. I also found Rory to be a wonderful character, and I loved that she had such a complex backstory. And Brady and Eve were realistic to me too as they navigated their lives post-Maddy. In addition, I thought the author did a wonderful job in exploring grief. Because Maddy took her own life, it added an extra dimension to Brady and Eve's ability to cope with her death. They both were trying to learn what made Maddy so desperate (because they truly had no idea), and the guilt they experienced added to their pain. I have no real-life comparison to their situations, but I did find their portrayal extremely realistic. And last but certainly not least, I really liked the twist at the end of the novel. I am not going to say much about it because I don't want to spoil it for future readers, but I will say that it was quite the surprise for me. I especially loved that their was a feeling of hope and love throughout the story even though there was also a lot of darkness. I guess it's a great metaphor for life, right? I LIKED MY LIFE would make a wonderful book club selection. There is a reading guide with thirteen questions. Some of the themes you might want to discuss include love, motherhood, marriage, grief, and guilt. In addition, I think the roles of parenting for both Maddy and Brady are especially interesting. I really enjoyed I LIKED MY LIFE. It was touching and smart (and even a little humorous). The book is out in hardcover now and trade paperback on May 8th. Highly recommended to readers who enjoy stories about families. I listened to this one and really enjoyed it too. Thanks for linking to my post! I loved this book too! My book club also had so many positives about it with lots of discussion points! Glad you read this one! This one sounds interesting! I'm going to take a closer look. Kid Konnection: Oh So Pretty Picture Books!